Did you know you can have excellent English language skills and still fail IELTS? HOW CAN YOU BE GOOD IN ENGLISH AND STILL FAIL? -That’s unfair. Well if it is impossible to understand your argument because of poor spelling and grammar, then the examiner does not know if you answered with the correct Task Response. So the best way to prepare is to discover where your mistakes are so you don’t make them again. IELTS Exam skills are unique to the exam, and are not directly language related. You cannot generate ideas or you suffer from “my mind goes blank”. You struggle to organise your thoughts into strong coherent paragraphs. You have challenges to write two essays in 60 minutes (on a topic you probably know nothing about!). Unless you have solved these problems you will continue to fail IELTS. I know this because I have helped hundreds, possibly thousands of IELTS students pass IELTS (I’ll explain more later in this page), and I can help you pass too. Your essay correction is a video, so you get to HEAR what your tutor is thinking. Discover mistakes you had no idea you were making. Each exam component explained and evaluated. Task Response evaluated and guidance given on how to improve. Cohesion and Coherence analysed with immediate feedback. Grammatical Range and Accuracy: Mistakes not only identified but corrections and suggestions given to push further improvements. All our essay correctors are EX-IELTS Examiners. How do I start improving my writing? All purchases use 256 bit encryption so your data is safe (on the secure checkout page you will see a green icon in the address bar of your browser). On the thank you page you will see three IELTS Writing Task questions (Task 1 Academic and General, and a Task 2). Use pen and paper, and then type it out on the computer, write it in exam conditions -this way we can make a true assessment of your ability. 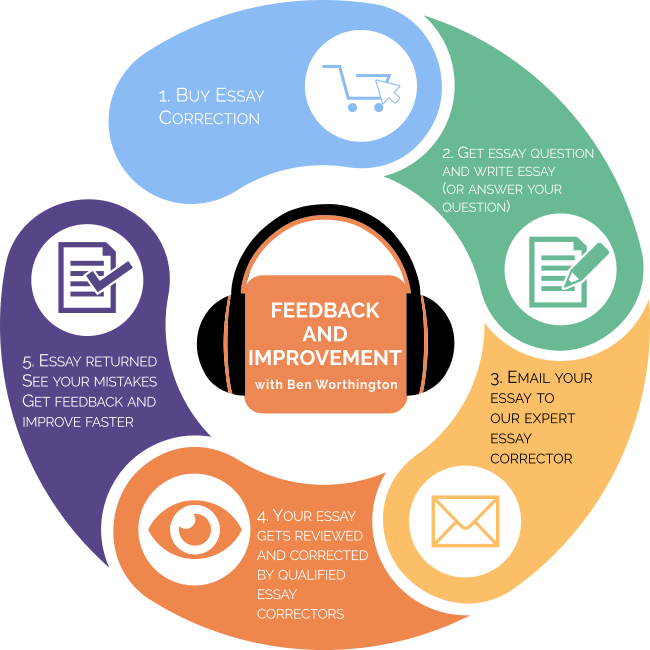 The tutors can help with your essay skills, but the language will be the main focus because teaching how to write a high scoring IELTS essay needs full tutorials. You need to know what to write and how to write it. Internet security and buying online. When you buy on this site you get taken to IELTSpodcast.teachable.com on this site there is SSL (Secure Sockets Layer), which means your credit card information is 100% encrypted and secure. In fact, the secure certificates mean full 128/256 bit encryption. The green https (browser address bar) on IELTSpodcast.teachable.com is a sign you are using a secure connection. Access to Speaking and Reading courses. Maria took the exam for the first time and got 5.5 in the writing. She joined the online course, wrote the essays, got the feedback, and is now in Australia. She even scored a Band 9 in one of the sections! Weiyan is a self-study student in China wanting to immigrate with her family to Canada or Australia, so she needs IELTS. She jumped a whole band! Happy New Year and here’s the good news! I pass the exam with an overall 8, and 7 for writing, 7.5 for speaking!!! Thank you so much and the whole IELTS Podcast team. I would have not achieved this without your help. With this email, I’d like to share with you my story with IELTS and how I came to know you. 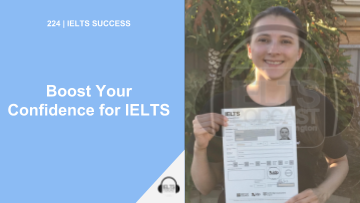 I first started to take IELTS in early 2017, then about a year later in 2018 and I started to take the exam quite intensively at the end of 2018, because I wanted to pass it as soon as possible, as you might know I lose marks with immigration as I get older year by year. However, my writing was stopping me from passing the IELTS. I got 6.5 for three times. That was when I began to really think I might have missed something or I might have made some mistake. Before I came to the IELTS Podcast, I did mock tests using the official test preparation books and self-mark my results. I’d say after about two or three months of intensive self-training using your materials and methods, I finally scored 7 with my writing. Actually I scored 7.5 in writing in the first time and 7 in the second time, so it proves that what you are teaching is definitely working! !